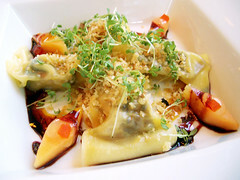 Last year, David and I went to Nougatine (Jean-Georges’ more budget-friendly restaurant) for lunch. The food was decent — except for a splodge of old micro basil gunk atop of my grilled squid — and affordable (3 course lunch prix fixe for $24.07), but the entire time I longed to be at Jean Georges next door. Sitting right by the entrance of Jean Georges, I felt like I was sitting at the uncool table while the cool table was just a few feet away. So this year, when the opportunity to take out-of-town guests to a nice restaurant presented itself (Gruezi Alvin and Alli! ), I made reservations at Jean Georges. Unlike high school, coolness was just a click and $98 away. Once at the restaurant, Alli, Alvin, David, and I decided upon the dinner prixe fixe which included three courses and a dessert tasting for $98. I nibbled on everyone’s dishes, but I’ll be only writing about my meal. We also ordered a nice bottle of white wine, but of course, now as I write this post, the name of the wine eludes me. Oh yes, I rock as a blogger. But seriously, I’ll try to write things down in the future. 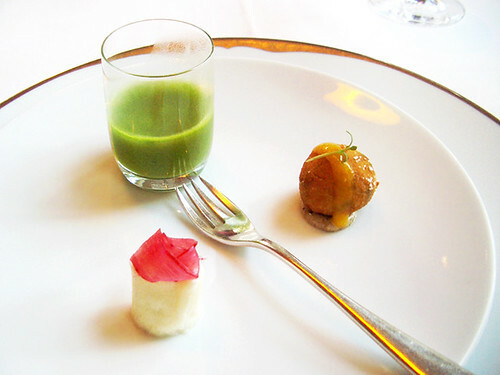 The meal began with an amuse bouche trio: herbal soup, house-made mozzarella with a pretty ribbon of rhubarb, and peekytoe crab. The herbal soup was decent, but not too exciting, as was the peekytoe. The fluffy mozzarella, on the other hand, was delightfully smooth as it fell apart in my mouth. 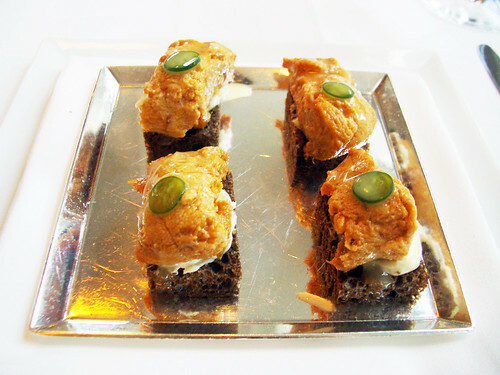 For my first course, I ordered the Santa Barbara Sea Urchin with yuzu and jalapeno served on top of buttered black bread. The crunchy black bread was a nice change from the usual rice, and texturally, contrasted nicely with the velvety sea urchin. In addition, the butter brought out the natural creaminess of the sea urchin. Overall, it was absolutely lovely. 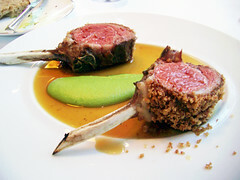 My final savory course was the Roasted Rack of Lamb encrusted with cardamom crumbs and served with fava bean puree. The juicy lamb was cooked perfectly with a good amount of red in the center. However, the fava bean puree was oversalted, so I ate the lamb with just the smallest dab of fava bean on each bite. It was still very good, but because I couldn’t eat too much of the puree, I wasn’t able to enjoy the flavor of the fava beans. For dessert, we were asked to choose among four options: caramel, rhubarb, chocolate, and apple. Each option comes with four tastings of a dessert following that particular theme. I chose caramel because one dessert under the caramel header, warm caramel tart, consisted of caramelized bacon. Unfortunately, the caramelized bacon came in powdered form sprinkled on top of dark chocolate and was too subtle to make an noticeable impact. Definitely not what I, Alli, or Alvin expected when we each ordered Caramel. In fact, when we initially asked where the bacon was when the tasting plate was brought out, and the server pointed to the “bacon dust,” there was a palpable sigh felt around the table. As for the other tastings, there was Caramel Curd with roasted pineapple sorbet, a Frozen Chocolate Pop filled with coffee-cardamom ice cream, and Vanilla Soda with a liquid caramel sphere. Unfortunately, none of the desserts really wowed me. I think the main problem was each tasting had too many things going on; it was quite hectic and the flavors didn’t coalesce. A little streamlining would probably help the dessert course. The meal closed with Jean Georges’ famous house-made marshmallows cut at the table, chocolates, tiny macarons, and intense fruit jellies. My favorite was the peanut butter and jelly macaron, which although too crispy, the flavor was spot on. 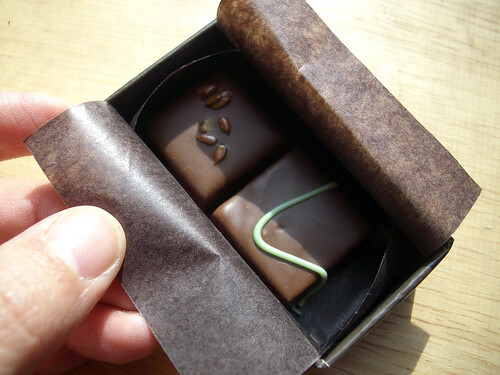 Alli and I were also presented with some chocolates to take home. It was a nice gesture. Rereading my review, it seems I had a lot of complaints, but in actuality, I found the dinner very good, and one of the more enjoyable meals I’ve had in recent months at a fancy restaurant. I criticize only because I know the seeds of perfection are there. Like a nagging mom, I criticize because I love. I’ll definitely be returning to Jean Georges. Great post and I love your photographs! I’ve had lunch at Nougatine as well and now after reading this post, I realize that I really need to head to Jean Georges for a proper dinner at some point. @aesis – Thanks for the nice words. Nougatine is fine, but nothing compared to Jean Georges in terms of food and service. If you ever do go to JG, let me know what you think of it. Let’s compare notes! @GG Merkel – I’m sure lunch at JG is just as good. Lunch in general is highly underrated! As for my camera, it’s just a 4 megapixel point and shoot (Optio S4). I had a nicer camera, but I broke it snorkeling in Menorca last summer. I’m planning to upgrade to a better camera, but I keep thinking the prices will go down. So far it hasn’t so I may just bite the bullet.